The Bruxism Association is a not-for-profit organisation registered with the Department of Trade and Industry. We are committed to helping all those who suffer from Bruxism. 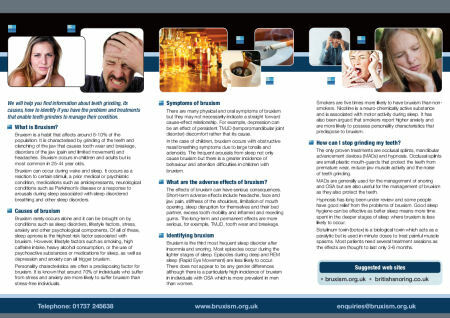 The Bruxism Association was established in 2008 by The British Snoring & Sleep Apnoea Association in response to an increasing number of enquiries from bruxists asking us to help them resolve their problem. Conventional treatments such as stress reduction, hypnotherapy and acupuncture can be successful for some people but clinical evidence is not so convincing. However, in recent years Mandibular Advancement devices (MADs) that are normally used for snoring and mild sleep apnoea, have proven to be a successful treatment for many bruxers. The Tomed SomnoGuard AP is a particularly robust device that can withstand heavy use for several months. However as with any treatment, mandibular advancement is not suitable for everybody. We are dedicated in our efforts to find treatments that have good clinical evidence of their effectiveness. We are pleased to introduce a new range of occlusal splints which have all the qualities of providing a safe and effective treatment. In recent years the introduction of the toxin botulinium (botox) has increasing evidence of its effectiveness in reducing the frequency of bruxism events and decrease in bruxism-induced facial pain. In recent trials comparing botox to occlusal splints, botox was found to be very effective. The Directors of The Bruxism Association are members of European Sleep Research Society, The Royal Society of Medicine, the British Thoracic Society, and the British Sleep Society.